Vinda-who? Has it been this long since I’ve dined in an Indian restaurant? I suppose so. You see, I’ve been spoiled by always having plenty of Indian friends while growing up that the taste of authentic curry was never too hard to come by. Nowadays though, things have gotten a bit dicey. I’ve long forgotten what many of my favorite types of dishes were called, or what they consisted of. But perhaps the most tragic thing I managed to forget was how terrifically easy it is to cook up a simple curry. And in my book, it doesn’t take very much for a curry dish to taste very good. I was recently given a little jar of hot Vindaloo curry powder as a souvenir from London’s famed gourmet grocery, Fortnum & Mason. The moment I cracked open its gold paper seal and took a smell, everything came back to me. And I mean everything — the late-night leftover binges, the time I spilled turmeric-stained rice all over my parents’ car, and especially the way my best friend in high school’s carpeted house smelled. Curries have an infectious olfactory strength that I find naggingly difficult to draw any comparison to in Western cuisine. But anyway, I was intrigued not only by its smell but by this one’s unfamiliar name. The British love their curries, and evidently one of their favourite (note clever spelling) varieties is the often searing-hot Vindaloo. But that’s not how it all began. A Portuguese dish adapted by the Goan region of western India, Vindaloo in its current state is rich in warm spices like cinnamon and cloves. By contrast, the Portuguese dish, described as a somewhat drier sautee of pork, sounds nothing to me like a curry at all. Its name implies wine (“vin”), vinegar and garlic, its three main components. But, such change is the way of food and life. 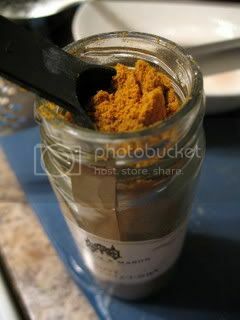 Hence a Vindaloo curry powder blend, as exemplified by my jar, is not very dissimilar from Madras curry powder, which hails from the region of the same name in southern India. Its ingredient list names turmeric, cardamom, coriander, ginger, cloves, nutmeg and cumin, not to mention a heavy dose of hot chile — be warned. So like being roused by smelling salts, I was instantly inspired to make this curry, and soon. Nothing too fancy, either. I find plenty of potatoes and peas especially comforting, and was happy to use an overripe tomato hanging about in my fridge. Alternatively, there’s always room for adding more or other veggies that happen to be in season, like sweet potatoes perhaps, cauliflower, chick peas, okra, and the list goes on. In choosing the meats I tried to aim for something a little more interesting. When it comes to cooking lamb, many reach for jammy fruits like cranberries and apricots, or otherwise fresh herbs like mint or rosemary. While these are all nice, I think lamb takes spice pretty well. Its gaminess isn’t masked, but rather lingers after the heat and intense flavors first strike, creating a little more dimension. 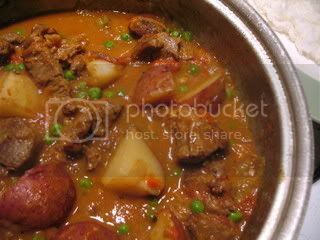 While doing some online research for lamb curry recipes, I was pleasantly surprised to see that Kalyn had done some serious scouting in this very turf. Her adapted Lamb Curry with Cauliflower and Double Cilantro recipe looks quite promising if you choose to go with it instead — plus, she draws up a whole batch of lamb curries from other bloggers. The optimum preparation of any curry would be to fashion a quick paste from freshly toasted seeds and other ingredients, all crushed up together. Not only would you get stronger flavors, but you get to know each spice you’re putting into your curry, and how much of them. While using primarily a powder for flavor, I added a touch of garlic and a chopped-up small chile to my simple Vindaloo recipe below. I’m not sure how much these details weighed in at the end, but I’d like to think that they added some freshness to the overall dish. Though I gotta say, it feels good to let a prepared powder do the heavy lifting sometimes. In a covered skillet, heat the oil on high. Brown the lamb pieces, turning to brown each side every couple minutes or so, about 5 minutes total. While browning, season the lamb with salt and black pepper. 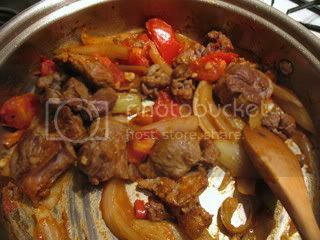 Place lamb pieces into a bowl. Turn heat to low and add the onions. Cook, stirring occasionally, until the onions just begin to soften, 3-5 minutes. Add the chili pepper, garlic and tomato. Stir mixture under medium heat, scraping up any browned bits from the bottom of the pan with a wooden spoon or spatula. Add the curry powder and lamb and stir to coat everything thoroughly. Add the water, vinegar and bay leaf, and bring mixture to a boil. Turn heat to low, cover and simmer for 30 minutes. Stir curry and add the potatoes. Simmer covered for another 15 minutes. Leave cover partially opened and cook for 15 minutes more. Taste for seasoning. If curry is still too soupy, cook uncovered over medium heat until the sauce reduces to desired consistency. Add the peas at the last minute of cooking (if using another vegetable that requires a little more softening, add sooner). Serve alongside steamed rice. Seven brownie points: The downside of using powdered spices instead of fresh is that you’re not getting all the nutrition that you could have gotten. The other down side is that lamb stew meat, so I’ve learned this evening, can be extremely fatty. When I have to play butcher for a while before I begin to “cook,” snipping and slicing away pieces of fat, well, let’s just say, you have to be in a patient mood for this. The good part about this dish is that it’s so easily variable, that you could swap in lean chicken, tofu, or simply vegetables to produce a savory, healthier result. Oh yum! I love your blog and all the recipes you come up with. I’ve gotta get back into making curries, too. They’re SO good! I have done chicken curry, but I do want to try a curry veggie dish. Looks good ! I haven’t been lucky enough to truly explore Indian foods. 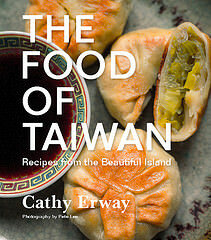 My experiences have been homemade common dishes, samosas, jeweled rice, and a few mild curries. I enjoy yellow curry, and, I’m not comfortable with grinding my own seeds, so I cheat and grab a bottle of Trader Joe’s yellow curry sauce. Straight out of the bottle with veggies and meat of choice it’s got a little kick, add however much coconut milk to tone it down for the non spice lover. I just can’t appreciate lamb curry yet. 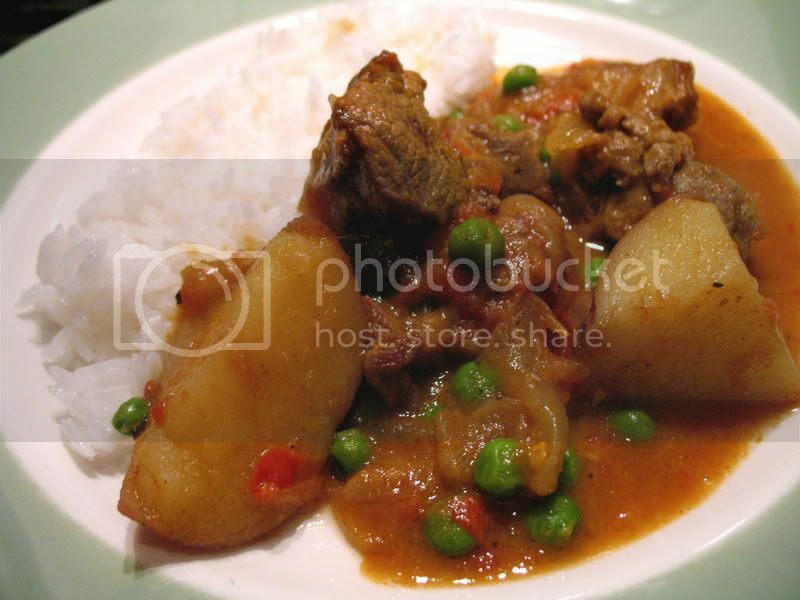 Something about my childhood experiences in SF Chinatown with neon yellow/green specked lamb curry turns me off. Nice vindaloo, nice re-design, and nice seeing you at the show last week. A couple of dried apricots reconstituted and pureed into the sauce is nice too, and adds some deep sweetness which is nice against the gaminess, and would go well with the tomatoes too. I’m working out a lamb tagine in my head, which I will be sure to post a recipe for whenever I get around to cooking it. wow, I’m scared to cook real Indian food too, it seems like a lot of ingredients to pick up, but then I guess if you’re going to cook it often it’s worth it! Thanks for the vegetable Samosa dish. Based on my experience the real secret to making great Samosas is in the way you create the patato filling. If the filling is well prepared, half the battle is won. The recipe looks easy to follow.Will try it soon.